I used to feel so out of my element when I styled a coffee table. 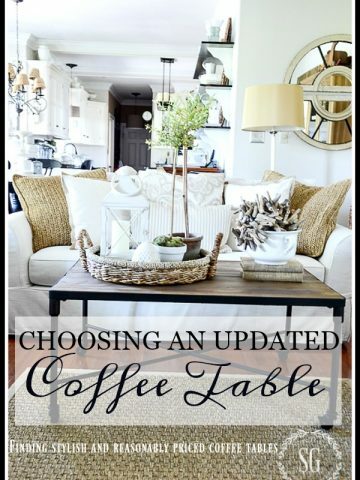 After years and years of frustration, I was determined to find a way to style a great coffee table… EVERY TIME! After lots and lots of research and practice I’m now a confident coffee table stylist!!! 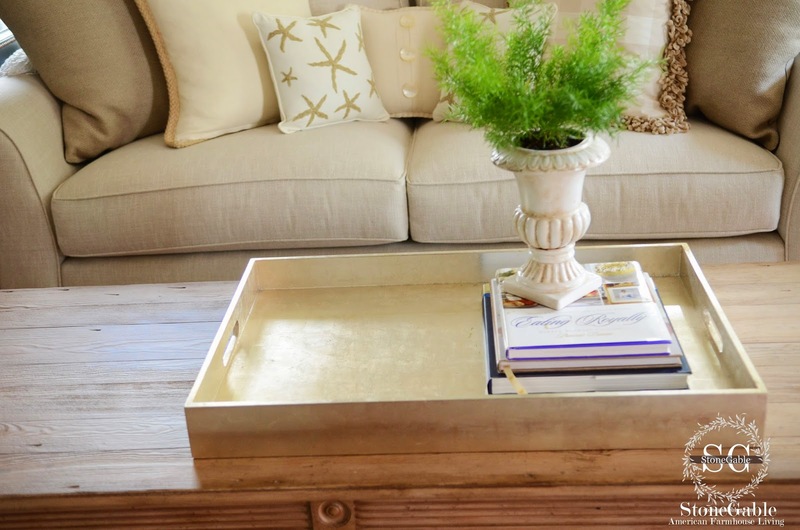 I’ve come up with 5 no-fail tips to style a coffee table like a pro! 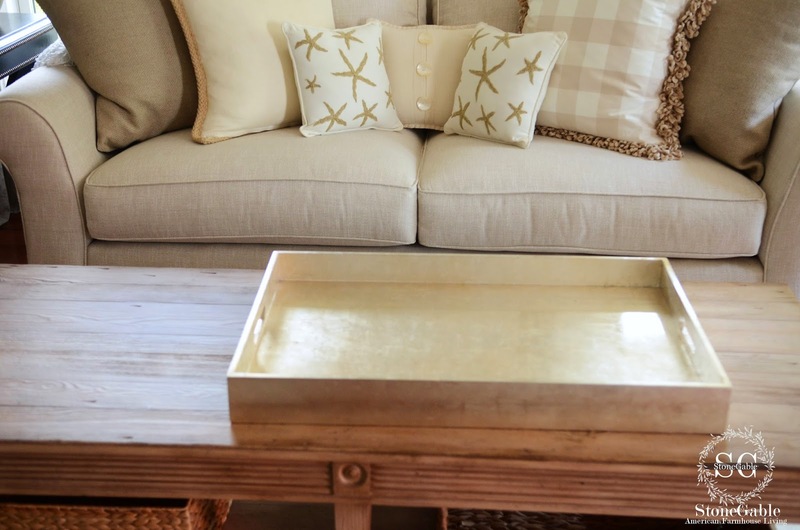 What I found so so surprising is that a coffee table does not have to look like a work of art! It does need to be comfortable, pretty and easy to style! 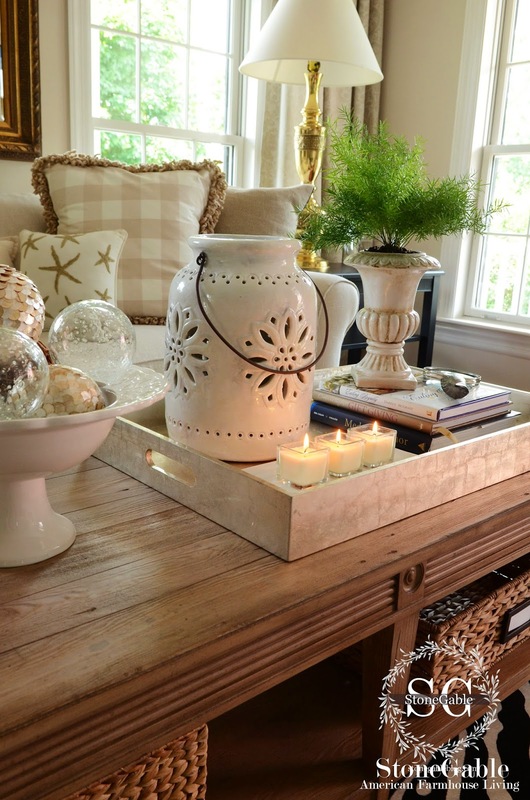 I also was not going to spend a lot of money to style a coffee table … so, I shopped my house for the decor! With that in mind I came up with a simple 5 steps for coffee table styling. 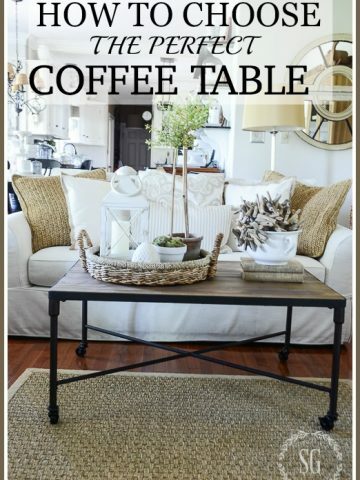 Let’s style my living room coffee table together! This is going to be fun! 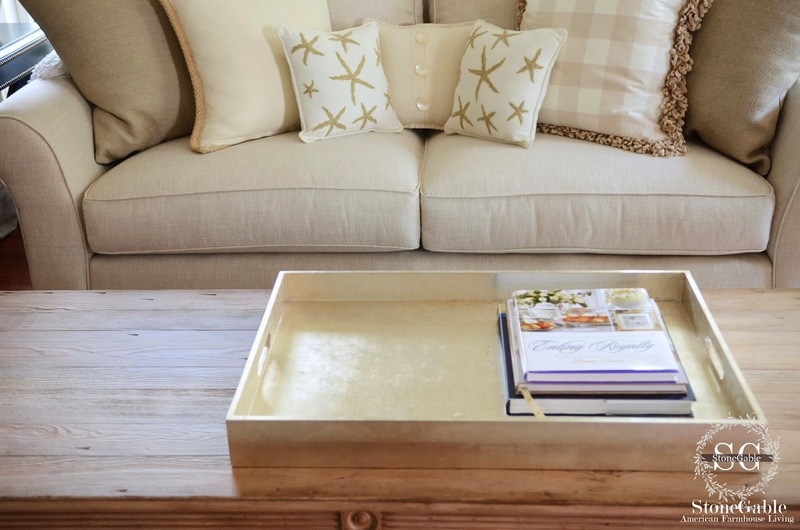 One of the best design elements to use on a coffee table is a tray! Trays can be square, rectangle, round, wood, baskets or even acrylic! They are great to corral decorative items, keeping them neat and organized. The tray I picked is a soft gold acrylic. Layering objects looks very interesting. Books are great things to layer. We are going to layer them in the tray from largest to smallest. Keep them neat.Great! But we’re not done layering yet! Plants and flowers are wonderful organic touches! Let’s layer a small fern on top of the books in the upper left corner. Now, let’s layer a magnifying glass with a horn (organic) handle next to the fern. Doesn’t that make a nice little layered vignette? We want to fill the tray with objects that have differing heights. We have a nicely layered vignette on the right side of the tray, so let’s balance it with elements on the left. Let’s add a big piece of pottery. The fern is tall, the pottery is medium height, the books are low and the sides of the tray are even lower. This let’s our eyes move around the tray and take in all the interesting things in it. It’s very important to style a coffee table using things of varying height. I think every coffee table should give off a little candlelight! We have just enough space to tuck in a trio of small candles on a long tray in front of the piece of white pottery! The candles fill up the tray, without it looking crowded! The tray is done… styled simply and well balanced! But what do we do to the other side of the coffee table? Does that get styled too? Let’s balance the tray with one showy piece! 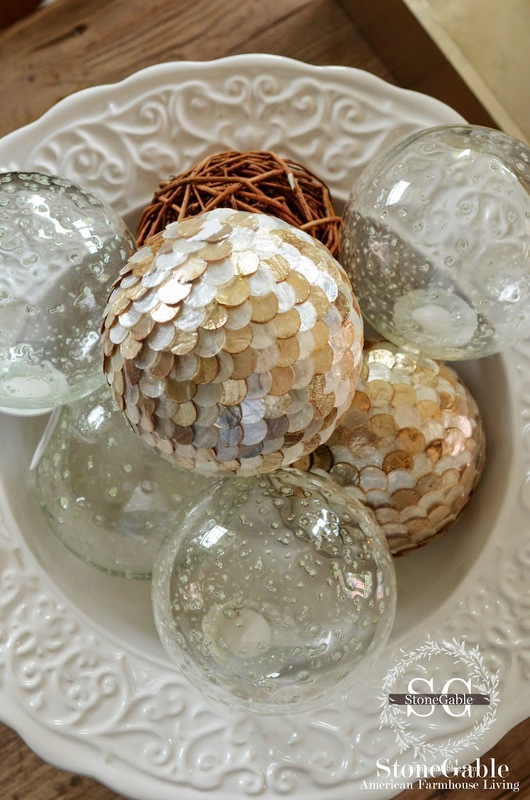 A white footed bowl filled with fun baubles. The bowl and baubles adds another layer of height and it holds organic twig balls in it… reinforcing 3 of the 5 styling tips! Height, layering and organic elements! And just for a fun touch, the clear baubles glow in the dark! 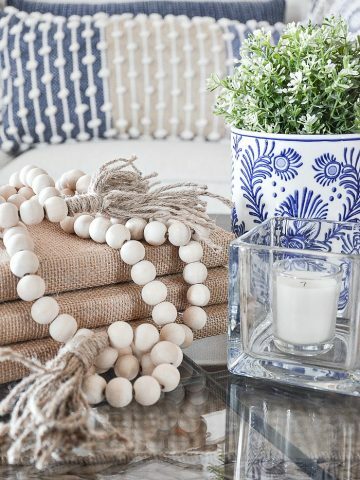 Using repeated colors will help to make coffee table decor more cohesive. 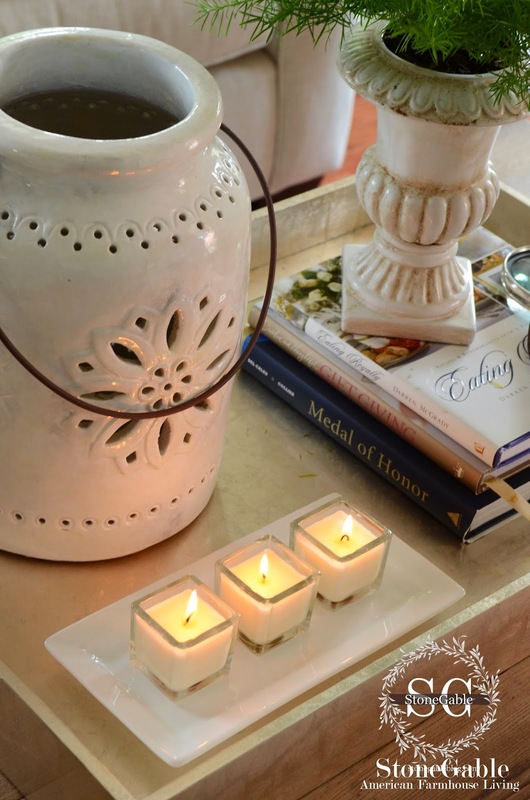 I used lots of whites and neutrals styling my living room coffee table. These colors work well in my room. 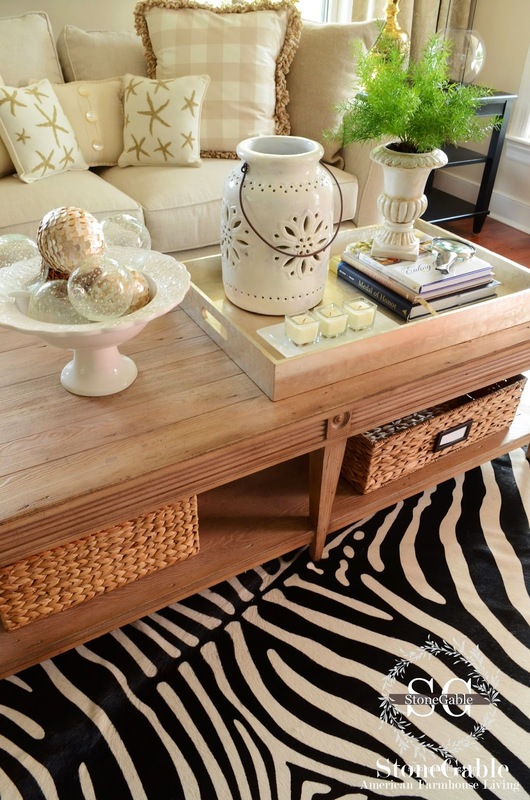 Using a combination of textures when styling a coffee table makes the design more interesting! Can you find at least 4 textures on my coffee table? Only style a coffee table with what you love! Remember it’s your creation, your home and you need to enjoy it!!!! That was EASY wasn’t it! This is coffee table styling 101. Practice and get comfortable using these 5 simple tips! 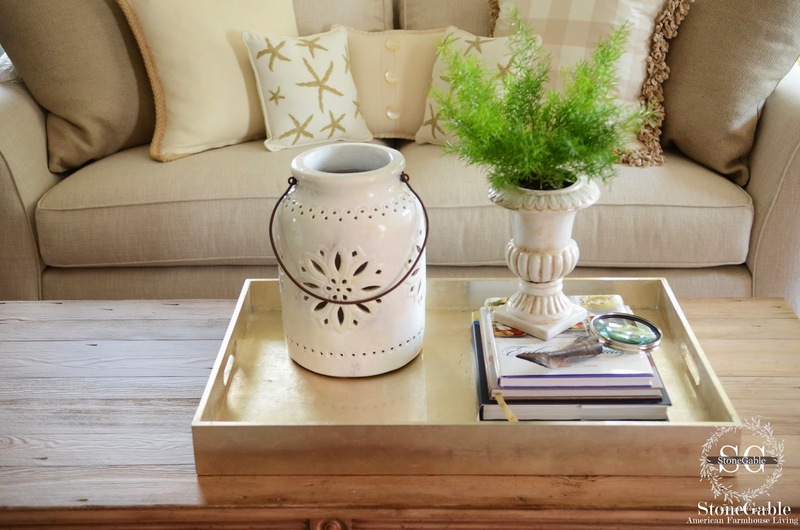 Styling a coffee table should be simple, easy and created with what you love!!! 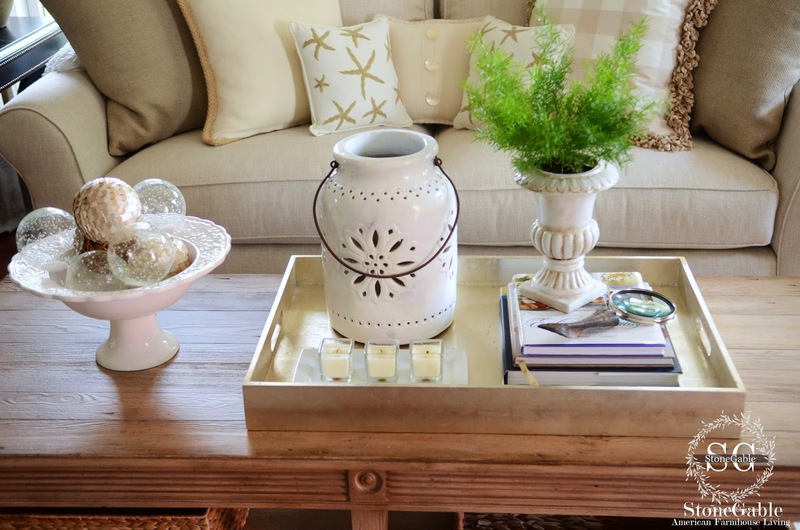 What are your favorite things to use when you style a coffee table? Remember to pin this to your DECOR or DIY Pinterest board. You can follow me on Pinterest and see all the great things I’ve found to pin HERE! Love having an eclectic approach, I have always loved mixing decorating styles. 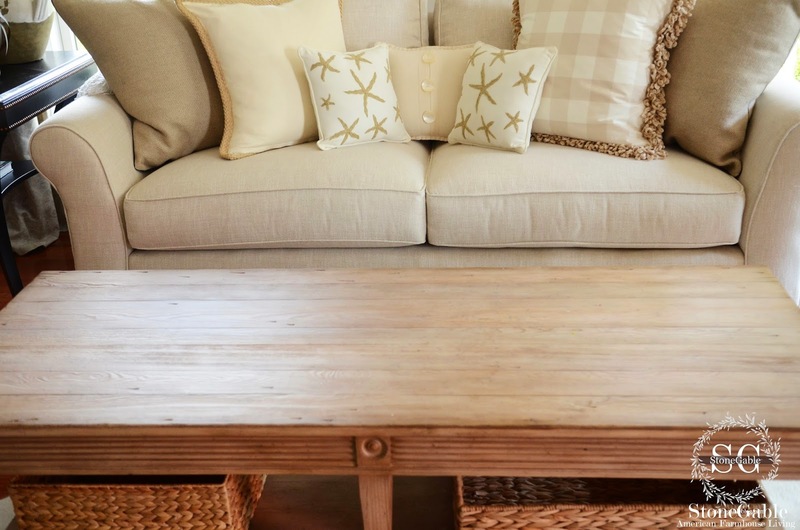 I love the neutrals, the coffee table design….most exciting for me is the sofa! It is exactly what I’m looking for, right color and size….do you mind sharing the brand? This couldn’t have come at a better time. I just replaced my old coffee table with a beautiful metal and glass one, with a glass shelf below. Your ideas will be put to good use. Great advice! I love the idea of a tray because you can move it around if you want to when people are using the table. I live in a male household and they don’t like it when I put items on coffee table because they like to sit their drinks on the table when watching TV. Sigh! I’ll be using thi tip. This is so beautiful. I wish I had a coffee table to decorate. I only have my husband’s ottoman and if I tried that, he would not be happy. I love, love, loooove your coffee table! I’ve looking for the perfect coffee table for a long time time. May I ask where you bought it at? Thank you ? Hi Moni, I found the coffee table at Hayneedle. Great price too! Are the textures things like glass, wood, pottery and paper? I’m never sure what decorators mean when they talk about texture. I’m not sure if it’s about something being smooth or bumpy or being woven. 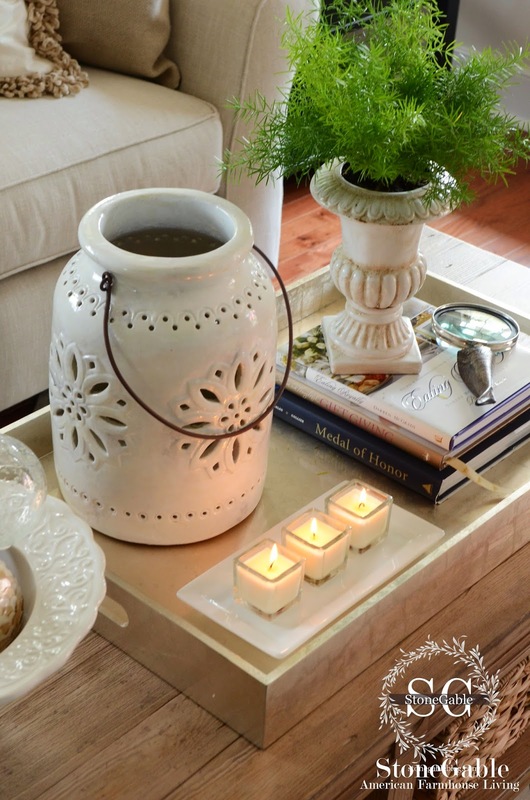 Beautiful and SO easy to follow for any readers unsure on how to decorate a coffee table. (Thank you also, Yvonne, for spelling “mantel” the right way!). Coming from a generation where Spelling was high on the list at schools, it’s nice to see correct spelling, etc! I love it! Especially love the fern. I soooo struggle with my coffee table. What ever I do doesn’t seem to work. I love to collect old silver teapots and trays and feel like everything needs a touch of black. Could you please show some examples with that?? Sounds like you are off to a good start Barb. Why not add a pretty candle and a small plant. That might look nice! Thanks for the wonderful advise! I like shopping my house for quick change ups too! Yvonne, my favorite tray was missing from your list. I love silverplate… brightly polished or tarnished. But I am older and still love the vintage and antique decor instilled in me by my nana. And nowadays I buy boxes of silverplate for just a couple of dollars. 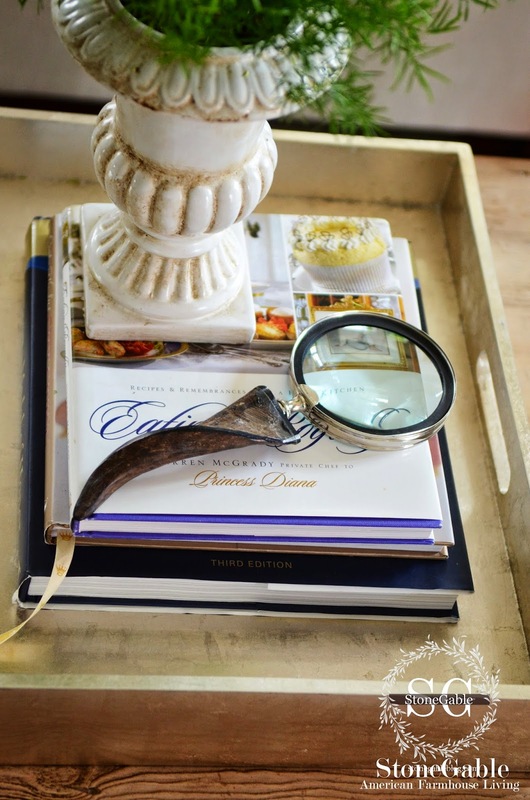 My decor is eclectic and I always enjoy your posts which help keep my ook eclectic yet current. Thank you for your devotion to your followers. Love your white star lantern, just wondering if you wouldn’t mind sharing it’s source? Love, Love your blog, it always gives me such inspiration! Love the addition of the candles. Really gives off that WOW factor. The tray and plant are also a great addition. I feel doing all of this will give whatever room the coffee table is in a peaceful look. Thank you for the styling tips! I really like your choice of tray. Could you tell me where you found that? The tray came from HomeGoods! Love your styling tips! Just started following you through Pinterest. Welcome to the StoneGable family, Kim! Good for you Lynn! I’ll be sharing my winter mantel next week. I found your blog a few months ago and I’m really enjoying it. You have so many wonderful ideas and present them in an “easy to do” manner that makes us feel we all can do it. You are fortunate to have a Pottery Barn Outlet near you. We have a Pottery Barn store but it’s usually a little too pricey for me so I get the ideas from them and then go to Home Goods and try to find things to replicate it! Works well for me. I’m one of those people who gets depressed when all the Christmas decorations are put away as everything is so dark and drab so I really appreciate these ideas of winter decorating to make our home cozy. Thanks for sharing all your wonderful ideas. Your design style is beautiful. And your recipes – awesome. Where can I buy the baubles that glow in the dark ??? Hi Shirley, I think I got those fun baubles at HomeGoods! the in-betweens that are sometimes perplexing! Since the coffee table tips was published I’ve gotten so many requests for tips on styling a mantel. Look for a post in September! can’t pin this styling a coffee table link on Pinterest…comes up with “Not a valid URl SITE.” …….HELP! I was able to pin it. As with all your posts, this one is inspiring, lovely and informative! What a great idea to include the baubles in the pretty white dish. You’re a delight! Hope all is well at StoneGable! And…hope Chris is recovering well from surgery! Beautiful! I love your vision in decorating you put everything together so perfect. love it. Beautiful! 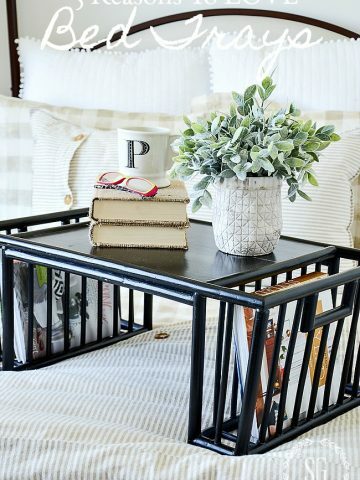 I think it is so fun to style a coffee table. Your styling is wonderful. Thanks for sharing. I miss really Princess Diana, too. I have coffee table books that are specifically about her. Yvonne, can you do a blog about where and how you store your decorative elements when rotating them seasonally? I tend to leave the same vignette out because I struggle with storage space for new items. Even though I have lots of opportunities to create interesting spaces with tabletops, consoles, a mantel, etc. I’d really appreciate your ideas. Hi Laurie: I have the SAME problem! I moved from a house into a condo and for someone who loves decor and also has hobbies, such as oil painting, etc., it is very difficult! I hate to admit it, but I use under the bed for a lot of items. I also have a 6′ shelving system in what once held my Summer clothes but it is filled to the max. 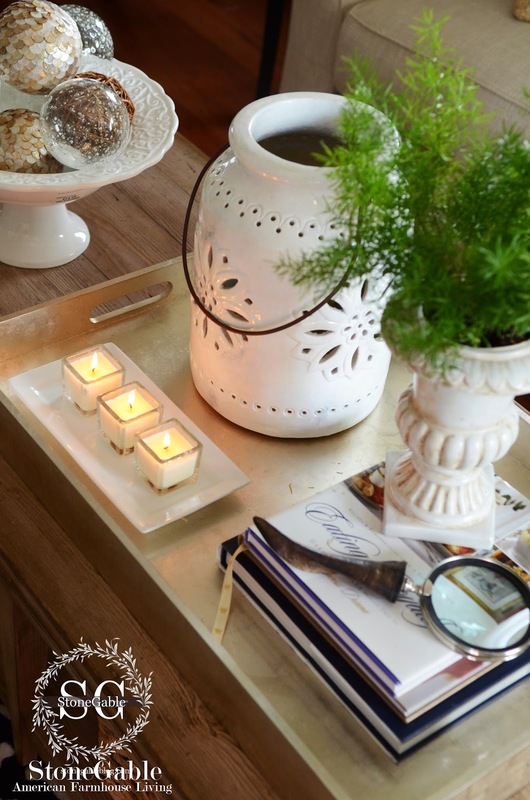 I am always changing vignettes to suit the Season and in between the Seasons! I collect blue/white ginger jars, vases, etc. so I store my (Summer) seashells inside those and no one is the wiser, I hope! I also have a few chinoiserie chests (in lieu of two end tables) so they hold many of my Fall and Christmas decor items. I also have a very large foyer where I have a secretary desk and bombe chest; they store many of my canvases. It is tricky – I sure wish I had a basement like Yvonne! I absolutely love this post! I look forward to every post you do. Thank you. How can I style my end tables? I have recliner sofas so I cannot have a coffee table in my room. Also I second the request for pro tips on styling a fireplace mantle. I have 12 foot high ceilings but my mantle is only about 5 feet high. lovely, just lovely. thanks for making sense of it. I’m in the process of re-doing an old coffee table right now, adding a shelf below for baskets. this was timely to give me an idea of what to do with the top as far as décor goes. 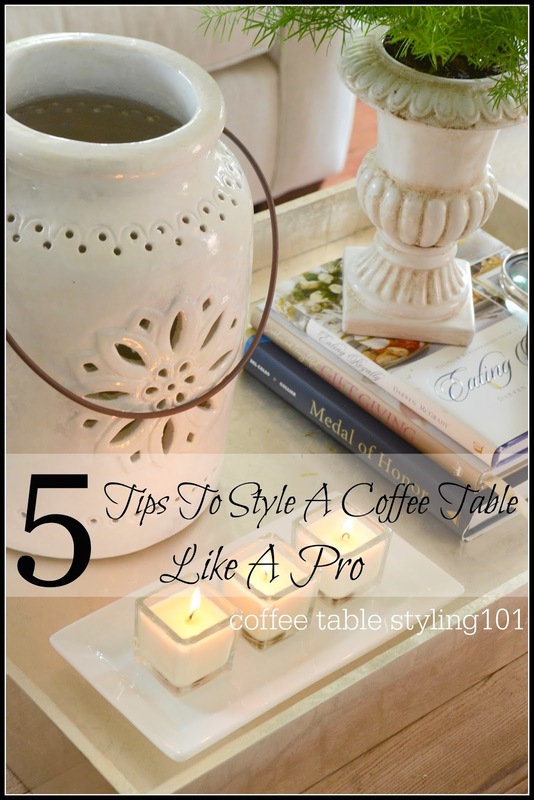 Such a beautiful table and you always style it “like a pro”….oh, you are a pro!!! So beautiful. ..and love your step – by – step tutorial. ..thank you for your great ideas. Well, that was such fun and I learned a lot! I think mine could probably use a “redo.” Wish you could run over and do the “redo.” Happy weekend! Looks so lovely and I love how you’ve made it so simple. You made me smile when you said it doesn’t need to be worthy of the Biltmore, just needs to look great at StoneGable. I love your heart! Looks fabulous. I love how beautiful you table-setting is. Gorgeous. Great tutorial too. I agree with Yvonne! I wouldn’t repeat the “round” shape with a round tray as it is then too “matchy” and looks too “planned” – if you know what I mean. Go for a rectangle or a square then have some fun! Hi Angela, I think a rectangle tray on a round coffee table would look wonderful! Maybe it should be the only thing on the table with all you accents tucked inside! Great tips, Yvonne. I just painted and changed out our living room coffee table for a round pedestal and tried my first vignette yesterday. I skipped the tray but next time I think I will add one. These tips will come in handy, so of course I pinned it for future reference. Just perfect, Yvonne! 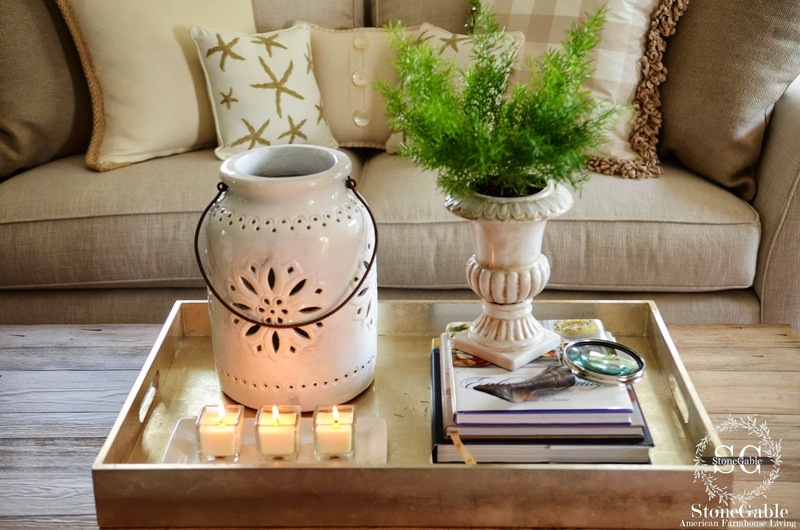 I love how your coffee table looks and the tips are awesome, pinning! In the process of changing out what is on a few tables. Like you, I like to use trays and something organic. Thanks for sharing your tips. Happy Weekend! What to do with my coffee table has always been a problem. I’m off to use your suggestions. Next, any ideas on how to style a mantle that is approximately 12 feet long?? Another bane of my decorating abilities. I have an oval coffee table, what shape tray should I use? Hi Beth, I think any shape would work on an oval coffee table… it’s all a matter of balancing the size. If you use a round tray or basket it needs to be on the small side for sure. Play around with different trays and you will find the one that works for you! Having a tray on the coffee table is the biggest tip you can give Antone. But your layering tips are the magic. I’m looking at my tray right now – it has an orchid in a brass pot, a shallow pottery bowl and a rusty metal fleur de lys. I better run and get some books to complete it. Thanks! Great styling tips! I love your tray not too obvious but it holds things together nicely! I just need you in my room, to give me confidence. Fabulous tips Yvonne. 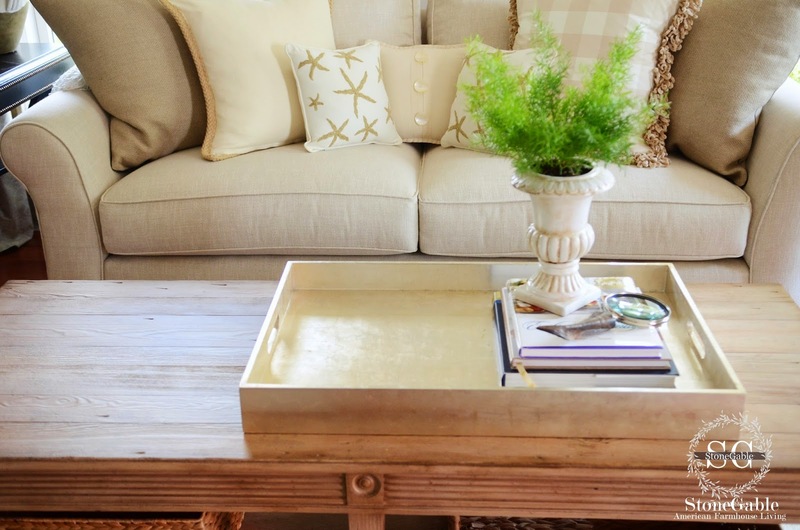 Styling a coffee table has always been frustrating to me. I move, move, move stuff, leave it, come back and move it again. Your trips will definitely help me get the “finished Pottery Barn” look I desire.